The communal celebration of the liturgy is the center of the life of a parish. It is in the liturgy that we express who we are as Catholics. The celebrant of the liturgy is the entire community, from priest to parishioner, from musician to minister of hospitality. If you are interested in joining this ministry, please contact Flo Harris for further information. Readers are welcomed for the weekend and weekday Masses. Flo Harris coordinates the readers at St. Mary’s. There is always an opportunity for our youth to participate in the liturgy. Regular training is held for altar servers throughout the year. For dates of the next training sessions, watch the bulletin,or contact Tracy Williams. Assisting our clergy before and after the Mass is a rewarding role, particularly for funerals. Full training is given. Please contact Flo Harris, if you are interested in the role of a funeral sacristan. If you enjoy meeting people, you could become part of the weekend Masses as a usher, welcoming our parishioners and our visitors. Contact Wayne Wohlers if you would like to become an usher. The Church has always seen music as an important voice of prayer. Over the centuries a rich tradition of liturgical music has been and continues to be developed. At St. Mary’s we are blessed to have a beautiful choir and musicians to assist our voices in prayer. St. Mary’s choir and musicians perform under the direction of Paul Schaefer. Parishioners interested in participating in one of these groups are invited to e-mail Paul to learn more. 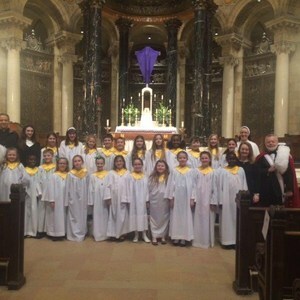 The youth choir of St. Mary’s and St. Michael’s, Chorus Angelorum, is under the patronage of the Holy Innocents(December 28). Rehearsals take place on Wednesday afternoons during the school year from 4:00-5:00 p.m in Corcoran Hall. The group sings at Sunday Mass once a month during the school year. Special programs are undertaken with the intention of enriching our Catholic Culture. Auditions are not required but an attendance commitment is required. A membership fee is charged to cover operating expenses. Music performed by Chorus Angelorum includes a rich variation of Sacred from Gregorian Chant to newly composed music. In addition, the choir is especially devoted to works of spiritual and corporal works of mercy. To inquire about membership or to be put on a waiting list, please contact Director, Anna Peters or by contacting the parish office. Children ages 10-14 are welcome!